When: Wednesday, December 7, 2016, through Sunday, February 26, 2017. 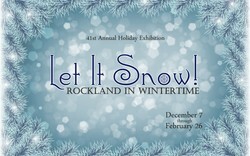 Join us for an exhibition that explores wintertime in Rockland County! From the commercial impact of the ice-cutting industry to extreme weather and the adventure of outdoor winter activities, this exhibition has it all! Including vintage film footage, photographs and news clippings, the exhibition also features the work of artists who have depicted wintertime in Rockland using the environment and terrain as inspiration. In keeping with our long-standing tradition, the 41st Annual Holiday Exhibition showcases a selection of miniatures and dollhouses on loan from the incredible collection of "The Dollhouse Lady." Also an ongoing tradition, the HSRC is also delighted to announce our annual raffle! Raffle tickets will be available throughout the duration of the exhibition! All proceeds of the HSRC Holiday Programs benefit the preservation and education efforts of the Historical Society of Rockland County, a nonprofit educational institution and principal repository for original documents and artifacts relating to Rockland County. Our mission is to acquire, preserve, and exhibit objects, buildings, and sites that reflect the history of Rockland County and the Lower Hudson Valley and to research, document, promote, and publicize the county’s rich historical heritage for the people of Rockland. The HSRC’s headquarters at 20 Zukor Road, New City, New York, consist of a four-acre site featuring the 7,200 square foot History Center; the historic Jacob Blauvelt House; and the post-and-beam Historic Barn and Carriage House. The HSRC is open, during exhibitions, events and programs, on Wednesdays–Fridays, 10 am–5 pm, and Sundays, 12–4 pm. Library research and tours of the Jacob Blauvelt House are available by appointment by contacting (845) 634-9629 or emailing info@rocklandhistory.org.